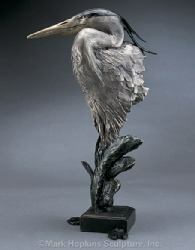 The slow down stroke of wide wings, the graceful arch of a long neck, the lovely blue of downy feathers; it is a vision of peace - the Great Blue Heron. Every morning these wonderful birds fly from their nesting grounds near the river in search of a good fishing spot. Each evening brings them back again to the nest.